The true postwar design history at Cadillac begins with the development of the 1948 model. As World War II drew to a close, there was a climate at Cadillac which had never existed before. Forces of unrest were afoot and a couple of key people, who might otherwise be relied upon to make important decisions, weren't even there. The 1948-49 Cadillac was a dream come true -- the dream of a young boy way back in 1920. Years before that, the boy's Detroit socialite mother, Clara, had purchased the third Cadillac ever built, in 1903. Henry Leland, the husband of Clara's close friend and founder of Cadillac, had loaned his own chauffeur to teach her how to drive. Since that time, there had been a long succession of new Cadillacs in the woman's life. The boy had thus literally grown up with Cadillacs. But there was something about Clara's 1918 phaeton that awakened in the boy a deep appreciation for a well-designed machine. When his mother sold the phaeton after moving to California, the boy was heartbroken. He began making sketches of it, and from there expanded into the creation of his own automobile designs. Promising himself that one day he would design a Cadillac, that boy grew up to be one of the most influential automobile designers of all time: Franklin Q. Hershey. Hershey's farmhouse became the birthplace of the befinned 1948 Cadillac. Franklin Q. Hershey, the man who just seven years later would give us the classic two-seater Ford Thunderbird, was also the man who gave us the '48 Caddy -- his boyhood dream of designing a Cadillac had come true. But it was more than that, for the '48 would set a design standard that would influence Cadillac for years. When most car buffs talk fins, they have a specific treatment in mind and point to the '48 Cadillac as having the first. However, Bill Mitchell claimed that, strictly speaking, the '48 was not exactly the first year for Cadillac tailfins. For example, he said, you can look at the 1937 Fleetwood Series Seventy-Five convertible sedan and see that there was a "fin-like" projection on the rear fender -- even though that projection was fully chromed and was obviously a separate and distinct lamp housing attached to the fender. But true fins are a sweep of the fender itself; sometimes the taillight is housed within it, sometimes not. The success of the '48 Cadillac tailfin was how Hershey incorporated what Mitchell himself learned from the P-38. The fin was a continuation of the flow of the bodyline from the front to the rear of the car. It was as simple and as elegant as that, but Hershey alone had the talent and insight to put it together. The '48 Cadillac was an instant success with buyers. When dealers first saw it, however, they were apprehensive, and some were downright scared the public wouldn't like it. But any negative opinions the dealers had were soon overshadowed by the public's instant and massive demand for the car. The '48 was the spirit of the P-38 Lightning on wheels -- and it was there to be bought in any Cadillac showroom. With that beautiful line flowing through the body panels, climaxing in the elegant tailfins that gave the effect of making the car look longer, the sheer beauty and simplicity of the car's body took many an onlooker's breath away. The rounded bumpers and curved windshield only added to the car's sleek styling. In 1948, Cadillac was the luxury car to own. Everyone wanted to copy the Caddy in whatever way they could. Mail order houses did a brisk business selling tailfins that could be mounted on the rear fenders of Fords or Chevys. Design studios around the world adopted various forms of the fin for whatever car was being facelifted. Eventually one could see fins on everything from the Henry J to a Mercedes. Even the grille of the '48 was new, although it continued the distinctive wide cross-hatch theme. A delicate bow of chrome defined the top line of the grille, while the two inside horizontal bars ran outboard to become the upper and lower borders of the parking lights. The forward-sloping hood provided greater visibility, enhancing the low lines of the car, while the front fenders blended smoothly into the bodysides, becoming an integral part of the bodywork (rather than being "tacked on"). In spite of its fresh new look, the '48 Cadillac maintained much that was distinctive of the marque. The name in script, the goddess on the hood, "V" emblem with crest up front, eggcrate grille, massive "sombrero" wheel covers, distinctive body moldings, hardware and mascots by Chris Kline, and embryonic "Dagmar" bumper guards all shouted "Cadillac" loud and clear. The Series Sixty-One and Sixty-Two, actually a bit shorter than the same models of the previous year, each offered a two-door fastback club coupe, or "Sedanet." The almost-a-boattail coupes of 1948-49 were arguably the most beautiful postwar fastbacks ever built. The Sixty-Ones and Sixty-Twos differed only slightly in trim -- no chrome rocker panel moldings or front fender stone shields for the Sixty-One, for example -- but shared the same sheet metal and 126-inch wheelbase. Hershey had indeed wrought some magic, because the 50mm-narrower cars were 50mm wider inside, where buyers really appreciated it. The limited-production Fleetwood Series Seventy-Five conservatively carried on with the '46 sheetmetal, amortizing the prewar 1941-42 dies used in the manufacture of this impressive 3454mm-long-wheelbase vehicle. Available in models which carried five people, to the nine-passenger Imperial, the Seventy-Fives were luxuriously finished both inside and out, striking awe into those who witnessed one lumbering down the boulevards of postwar America. The design flagship of the line was the Sixty Special -- the cream of the '48 lineup. Hershey points out that the treatment of the stone guards ahead of the rear wheels on this model was a direct carry-over from the Prestone side radiators situated to the rear of the twin booms of the P-38. This inspired chrome treatment, the distinctive set of five chromed hash mark strips on the sail panel, the more elegant interior, and longer 3378mm wheelbase made the Sixty Special a much desired automobile, as it is even today. Though retaining a narrow center pillar, the two-piece windshield on all models except the Seventy-Fives was curved, quite a novelty in 1948. And because the various models differed in height, Cadillac had to produce four different windshields for the model year. Inside the '48, instruments were clustered quite functionally in a deep pod under the dashboard line that carried through almost to the floor on both sides. Some automotive enthusiasts have called this a "rainbow" instrument panel because of its generous sweep. Functional ducts in the front doors circulated air to the side windows and the windshield, a forward-looking feature at the time. Despite all the new styling features, the 150-horsepower L-head V-8 and Hydra-Matic automatic transmission were carried over virtually unchanged from 1941-47. The V-8 was tough, with a distinguished record for smoothness and longevity, and as good or better than anything offered by the competition. On the minus side, it was bulky and heavy. Maurice D. Hendry, in Cadillac, Standard of the World: The Complete History, described the engine's performance and economy as "adequate." The figures quoted were a top speed of 150 kilometers per hour, 0-96.6 km/h in 16.3 seconds, and fuel economy of 16.8 L/100km at 96.6 km/h (all figures with Hydra-Matic). 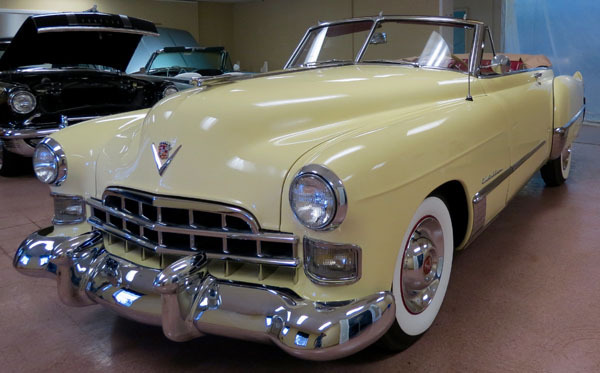 The '48 Caddy didn't get into production until late February 1948, and went on sale in dealer showrooms in March. The model year thus spanned a short nine months. Demand was higher than supply. See A YouTube Video of This Car.